Cancerous brain tumors are notorious for growing back despite surgical attempts to remove them – and for leading to a dire prognosis for patients. But scientists are developing a new way to try to root out malignant cells during surgery so fewer or none get left behind to form new tumors. The method, reported in the journal ACS Nano, could someday vastly improve the outlook for patients. Moritz F. Kircher and colleagues at Memorial Sloan Kettering Cancer Center point out that malignant brain tumors, particularly the kind known as glioblastoma multiforme (GBM), are among the toughest to beat. Although relatively rare, GBM is highly aggressive, and its cells multiply rapidly. Surgical removal is one of the main weapons doctors have to treat brain tumors. The problem is that currently, there’s no way to know if they have taken out all of the cancerous cells. And removing extra material “just in case” isn’t a good option in the brain, which controls so many critical processes. The techniques surgeons have at their disposal today are not accurate enough to identify all the cells that need to be excised. So Kircher’s team decided to develop a new method to fill that gap. The researchers used a handheld device resembling a laser pointer that can detect “Raman nanoprobes” with very high accuracy. These nanoprobes are injected the day prior to the operation and go specifically to tumor cells, and not to normal brain cells. 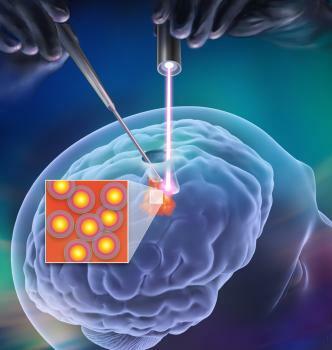 Using a handheld Raman scanner in a mouse model that mimics human GBM, the researchers successfully identified and removed all malignant cells in the rodents’ brains. Also, because the technique involves steps that have already made it to human testing for other purposes, the researchers conclude that it has the potential to move readily into clinical trials. Surgeons might be able to use the device in the future to treat other types of brain cancer, they say.